Tumor Sensitivity Assay | Cell Biolabs, Inc. Traditionally, the soft agar colony formation assay has been used to monitor anchorage-independent growth. Cells proliferate for 3-4 weeks in a semisolid culture medium, followed by tedious manual counting of colonies. Our CytoSelect™ 96-Well In Vitro Tumor Sensitivity Assay provides a stringent, anchorage-independent model for chemosenstivity testing and screening of potential anticancer drugs. 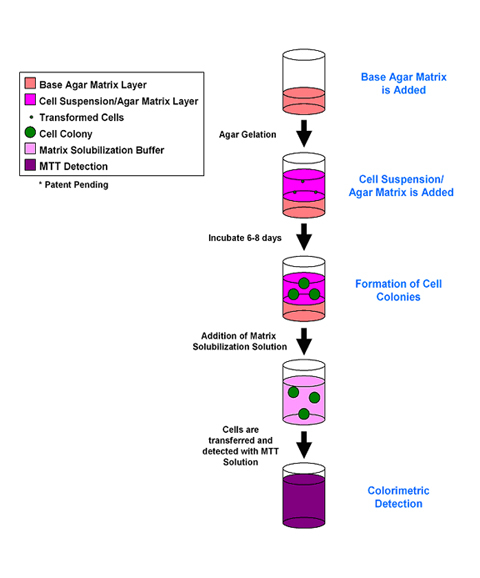 After just 6-8 days, cell colonies are quantified using a standard colorimetric microplate reader. Figure 1: CytoSelect™ 96-Well In Vitro Tumor Sensitivity Assay Principle. Figure 2: Inhibition of HeLa Cell Anchorage-Independent Growth by Taxol. 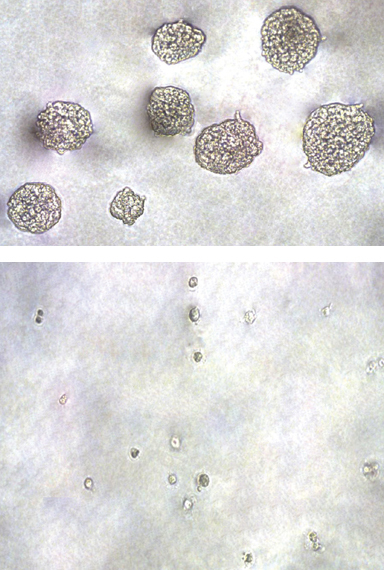 HeLa cells were cultured for 7 days in the absence (top) or presence (bottom) of 1 nM Taxol according to the assay protocol. Wei, R. J. et al. (2016). A microtubule inhibitor, ABT-751, induces autophagy and delays apoptosis in Huh-7 cells. Toxicol. Appl Pharmacol. doi:10.1016/j.taap.2016.09.021. Mukudai, Y. et al. (2016). Methanol and butanol extracts of Paeonia lutea leaves repress metastasis of squamous cell carcinoma. Evid Based Complement Alternat Med. doi:10.1155/2016/6087213. Damodaran, C. et al. (2016). miR-301a expression: A prognostic marker for prostate cancer. Urol Oncol. Doi:10.1016/j.urolonc.2016.03.009. Zheng, Y. et al. (2016). Glioma-derived platelet-derived growth factor-BB recruits oligodendrocyte progenitor cells via platelet-derived growth factor receptor-α and remodels cancer stroma. Am J Pathol. doi:10.1016/j.ajpath.2015.12.020. Joshi, P. et al. (2015). MicroRNA-148a reduces tumorigenesis and increases TRAIL-induced apoptosis in NSCLC. Proc Natl Acad Sci U S A. 112:8650-8655. Meador, C. B. et al. (2015). Optimizing the sequence of anti-EGFR-targeted therapy in EGFR-mutant lung cancer. Mol Cancer Ther. 14:542-552. Peng, Y. T. et al. (2015). Upregulation of cyclin-dependent kinase inhibitors CDKN1B and CDKN1 C in hepatocellular carcinoma-derived cells via goniothalamin-mediated protein stabilization and epigenetic modifications. Toxicol Rep. doi:10.1016/j.toxrep.2015.01.010. Akl, M. R. et al. (2015). Araguspongine C induces autophagic death in breast cancer cells through suppression of c-Met and HER2 receptor tyrosine kinase signaling. Mar Drugs. 13:288-311. Suman, S. et al. (2014). The pro-apoptotic role of autophagy in breast cancer. Bri J Cancer. 111:309-317. Suman, S. et al. (2014). Activation of AKT signaling promotes epithelial–mesenchymal transition and tumor growth in colorectal cancer cells. Mol Carcinog. 53:E151-E160. Bard-Chapeau, E. et al. (2013). EVI1 Oncoprotein Interacts with a Large and Complex Network of Proteins and Integrates Signals through Protein Phosphorylation. PNAS. 110:E2885-E2894. Takezawa. K. et al. (2012). HER2 Amplification: A Potential Mechanism of Acquired Resistance to EGFR Inhibition in EGFR-Mutant Lung Cancers That Lack the Second-Site EGFRT790M Mutation. Cancer Discovery. 2: 922-933. Li, C. et al. (2012).The Root Bark of Paeonia moutan is a Potential Anticancer Agent in Human Oral Squamous Cell Carcinoma Cells. Anticancer Res. 32:2625-2630. Itamochi, H. et al. (2011). Inhibiting the mTOR Pathway Synergistically Enhances Cytotoxicity in Ovarian Cancer Cells Induced by Etoposide through Upregulation of c-Jun. Clin. Cancer Res. 17:4742-4750. Kang, D.W. et al. (2010). Phospholipase D1 drives a positive feedback loop to reinforce the Wnt/ß-catenin/TCF signaling axis. Cancer Res. 70: 4233-4242.